Carleton offers a Bachelor of Arts in 33 majors. Students may elect to complete an interdisciplinary or discipline-specific minor. A minor may strengthen and complement a major, but a student pursuing any major can pursue any minor. Students may also design their own major with faculty guidance and approval. Here's how. Carleton offers courses, but not majors or minors, in these subjects. Carleton faculty curate lists of courses related to these topics. Our professors have an unparalleled commitment to teaching. 90% of Carleton students graduate within four years. Nationwide, the average is 38%. At Carleton, learning is up close and personal. 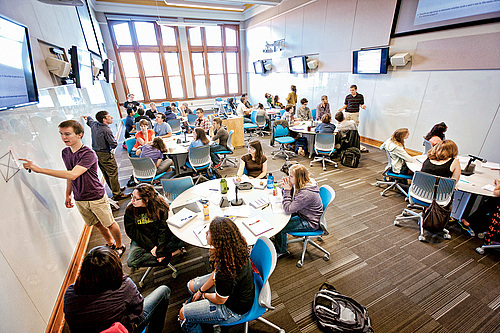 Our student/faculty ratio is 9:1, and the average class size is 18. From 2000 to 2011, Carleton graduates won 62 Fulbright, 19 Watson, 75 NSF, 9 Kresge Science, 16 NCAA Postgraduate, 2 Rhodes, and 1 Howard Hughes Medical Institute fellowships. 98% of Carleton seniors said they were happy with the quality of instruction at Carleton. Carleton currently ranks 3rd among U.S. liberal arts colleges in the number of doctoral degrees earned by its alumni between the years of 1966-2009. Profiles, bios, & CVs of all Carleton faculty – by name, department, and interest. Carleton's academic centers, programs, and initiatives play leading roles in liberal arts scholarship. Amanda Zeilinger ’19, a studio art and art history double major from Shaker Heights, Ohio, tells us about her senior capstone experience, or ‘Comps,’ in support of her studio art degree. William Lanzillo ’19, a studio art and psychology double major with an Africana studies minor from Glen Ellyn, Ill., tells us about his senior capstone experience, or ‘Comps,’ in support of his studio art degree.